It is easy to forget that every development in the history of the American information industryâfrom the telephone to radio to filmâonce existed in an open and chaotic marketplace inhabited by entrepreneurs and utopians, just as the Internet does today. Each of these, however, grew to be dominated by a monopolist or cartel. In this path-breaking audiobook, Tim Wu asks: will the Internet follow the same fate? 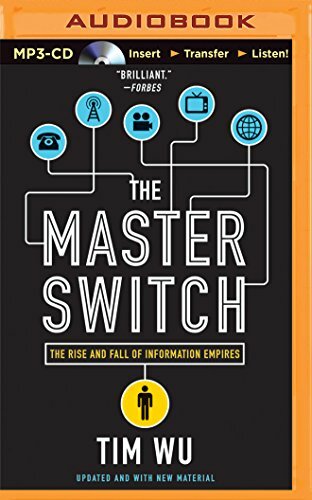 Could the Webâthe entire flow of American informationâcome to be ruled by a corporate leviathan in possession of âthe master switchâ? Analyzing the strategic maneuvers of todayâs great information powersâApple, Google, and an eerily resurgent AT&TâWu uncovers a time-honored pattern in which invention begets industry and industry begets empire. He shows how a battle royal for the Internetâs future is brewing, and this is one war we dare not tune out. About: It is easy to forget that every development in the history of the American information industry—from the telephone to radio to film—once existed in an open and chaotic marketplace inhabited by entrepreneurs and utopians, just as the Internet does today.